These days during huge news events, we are all scrolling through social media to find out the latest updates and see photos of what’s going on. As Princess Eugenie’s upcoming wedding is fast-approaching, I think about the local council’s communications team. The job of a communicator in these circumstances is often hidden behind all the fun and fanfare. In this post we get a behind-the-scenes peek at what it takes for a communications team to deliver social media for a news event that’s viewed all over the world. Louisa Dean, Communications and Marketing Manager at Royal Borough of Windsor & Maidenhead, has some fascinating insights and lessons to share about her team’s work on and during the royal wedding of Prince Harry and Meghan Markle. They’ll be using lots of the same tactics during the next wedding. So spare a thought for the team’s thumbs – tweeting every four minutes all day takes some doing! “Big events often happen in the Royal Borough of Windsor & Maidenhead. So far this year in the Royal Borough of Windsor & Maidenhead, we’ve had the wedding of the Duke and Duchess of Sussex, and the President of the United States visited the Queen at Windsor Castle. We also have another royal wedding in October between Princess Eugenie and Jack Brooksbank. I think the high profile events in our council attract people to the team, in certainly got me interested in this role as it is more than just the normal council job. I am really proud of the events that are held in the Royal Borough but also honoured that I get to work on them. People attending these events often don’t live in the borough. Twitter in particular allows us to communicate with this audience in advance of the event so they can prepare their journey and plan their day. It would also be our primary communication tool if an emergency situation happens and we need to be able to get our messages quickly. For the most recent event, the President of the United States visit, we made sure we had road closure information on the council social media accounts (@RBWM) as well as our tourism social media accounts (@visitwindsor). The wedding was a bit different – the scale of message, the variety of content and the planning. The team, led by Maddie Pinkham (@MaddieChilds1), planned our key messages for social media in line with the comms plan. We changed the way we normally produce content. We planned meticulously in advance, and this has had a direct impact on how we now function as a team. Most of our social media content is now prepared a month ahead, focussing on a monthly campaign. Maddie wrote the @RBWM tweets weeks in advance of the big day and worked with our in-house designer to create a suite of social media content including an animation congratulating the couple, tweet cards and short videos showing visitors and well-wishers the best walking routes the viewing areas. The prepared tweets covered everything from planning your journey on the day to the history of the procession route. Maddie had planned a tweet every four minutes to provide commentary to people in the town who couldn’t see a big screen. I looked at the tweets a week before the wedding and the bridesmaid and page boys one made me smile – that was our most engaged tweet – over 500 likes, and nearly 300,000 impressions! We also took the chance to have a bit of fun with our branding and changed our website and social media branding to reflect the celebratory nature of the day (with bunting strung along the top of our website home page and social media profile banners). In addition we took a friendlier approach to our press releases in the run-up – using the acronym PRINCE to get people thinking about planning their journey in advance. Parking – book it in advance. Road Closures – plan ahead. In Windsor – be prepared. Navigate to your preferred viewing spot. Commuting? Check out your route. This worked and saw our content was reaching new national and international audiences. We tweeted every four minutes from 6am until 7pm and got 700,000 impressions of the day – not surprisingly the most in the history of our Twitter account. During the week before the wedding we had 1.2million impressions on our Twitter feed. We had 537,865 unique visitors to our website compared to 446,739, an increase in website traffic of 20% since the same time last year. On Facebook we saw page views up by 215% compared to the seven previous days, page likes up 111% compared to the seven previous days and over 13,000 people engaged with our Facebook posts up 36% compared to the seven previous days. We haven’t seen a loss in followers since the wedding and because of the other high profile events we hold we are sure the engagement will remain high. We have also adapted our comms following the wedding so we do much more focused monthly campaigns with planned tweets and tweet cards which links with messages and images on our website. Everyone had clear tasks and focus. The comms team on the ground shared pictures on a WhatsApp group. The team in Maidenhead would save the best ones and link them with the prepared tweets. One person uploaded content to Twitter and Facebook and looked across key accounts and shared useful content – particularly our rail partners who were trying to get the crowds in and out of Windsor and Thames Valley Police who we worked closely with in the run-up and on the day. Our designer changed our animation of the couple on the day when we saw Duchess of Sussex’s wedding dress for the first time. We put a lot of focus into the wedding but we still needed to show the clean-up. We got photos out on social media on the day but the press release went on Monday and we probably missed a trick there. Plan, plan and plan again – keep looking at the plan and check your key messages. If we didn’t put the planning in, we wouldn’t have had some of those key messages signed off and ready to go if needed. It saved time in the middle of a very busy day. Be adaptable – you may not be doing your normal job in times of big events. Some of the team weren’t carrying out their normal roles. I had website officers managing a press pen for example. 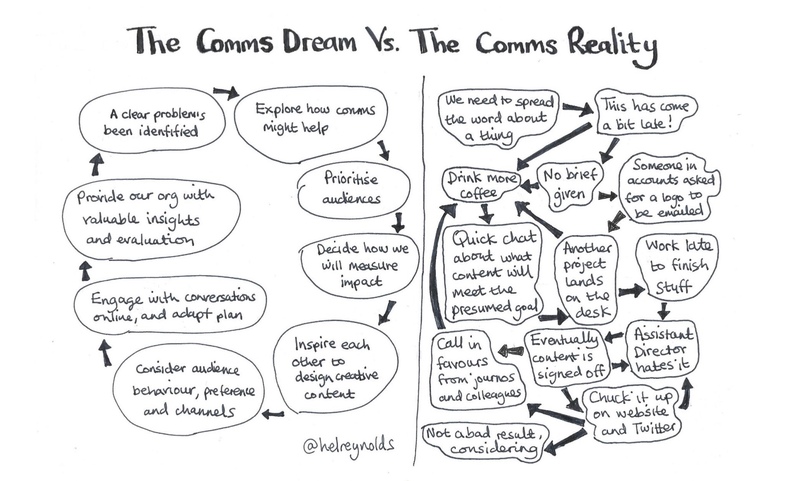 I also mixed up the comms, digital and tourism teams so instead of sitting in their teams they worked across functions. Be engaging – make your content relevant, fun and engaging. We saw more likes, retweet and sharing. Work with others – make sure you have strong partnership working relationships. Thanks Louisa, and I do hope you and your team have fun and lots of success with Princess Eugenie’s wedding in a few weeks. Next Social Media Marketing Awards: I won!